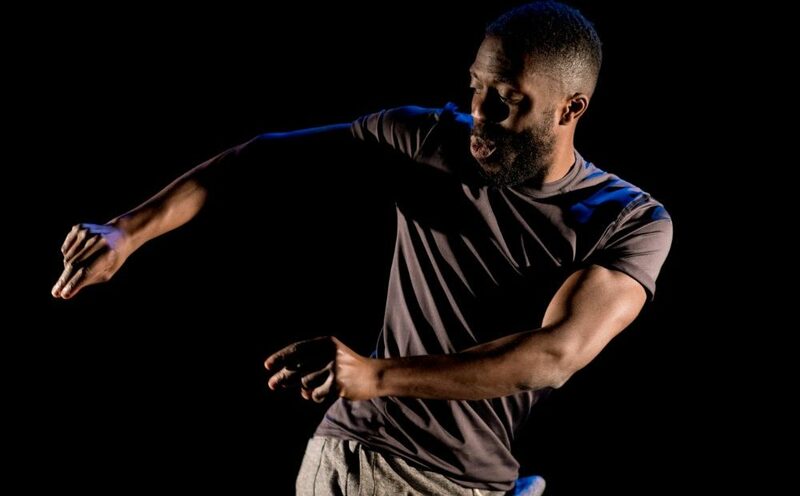 Creator and performer Lanre Malaolu alternates impressive physical sequences with scenes between Michael and the youth football team he coaches. We also hear from his unnamed mate, his barber, and a therapist, with each these encounters shaping Michael’s perception of his own mental health and masculinity. We also witness plaintive cries for help repeatedly trivialised, with the effects manifesting through movement when he has nowhere else to turn. Though the story is linear, it is a downward spiral of anguish exacerbated by the needling pressure to suppress any signs of weakness. Impressive speed and agility mark the moments where Michael’s day-to-day is aggressively interrupted. Though time stops and he is unable to move, his frenetic mind is manifested in frantic, mechanical movements that fly through space. I say mechanical, but not in the sense that he moves without thought or purpose – rather, his body is a machine of tension wherein the musculature attempts to free itself from the bones underneath. The choreography and its execution are riveting in both their physical and emotional precision. The piece still feels like it’s in development what with its simple structure and ending that, whilst there is plenty to praise, is abruptly disjointed from the established aesthetic. But its otherwise a compelling capture of a feeling that can eat you alive, and the struggle to not let it overcome you. Elephant in the Room runs through 20 April.